A Miracle of Science: Climb into that car and shake the paw of destiny. 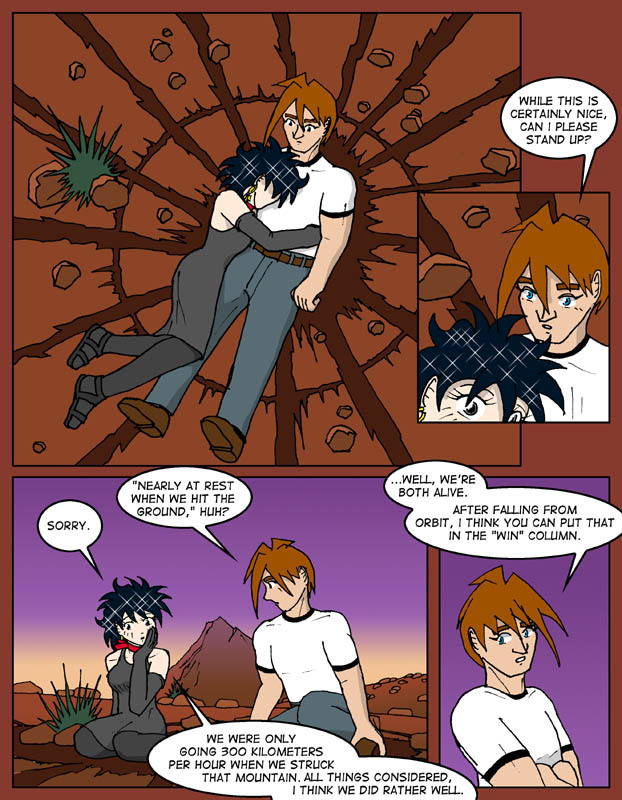 The mess around Benjamin and Caprice in the first panel is an ejecta blanket with attendant rays. An ejecta blanket is material thrown out of an impact event at low speeds, and rays are material thrown out at higher speeds. You can see these structures for real in Tycho Crater on the Moon. A pair of binoculars is enough to display Tycho in all its glory. I was going to make a smartass remark here about how the element Jon chose to comment on in today's page is the scientific detail of the crater our heroes are lying in. But, you know, looking back on the page I've gotta admit it. That crater does look good. Speaking of awkward segues, I've been meaning to mention for a little while now that longtime fave comic Paradigm Shift has started up again after a hiatus. So you should definitely be reading it if you have a Modern Tales subscription or are willing to just dive in and hope to make sense of the story -- it's worth your while.